The Jay Companies 1320397 Round Embossed Brown Charger Plate 14"
TigerChef > Tabletop > Tabletop Accessories >< Charger Plates > The Jay Companies 1320397 Round Embossed Brown Charger Plate 14"
$194.40 The Jay Companies 1270281 Round White Beaded Antique Charger Plate 14"
$177.12 The Jay Companies 1270283 Round White Aristocrat Antique Charger Plate 14"
$97.20 The Jay Companies 1320272-4W Round Brown Aristocrat Charger Plate 14"
$89.96 The Jay Companies 1320375 Round Beaded Antique Gold Charger Plate 14"
$89.96 The Jay Companies 1320376 Round Beaded Silver Charger Plate 14"
$89.96 The Jay Companies 1320378 Round Silver Aristocrat Charger Plate 14"
$52.12 The Jay Companies 1320381 Round Textured Cool Gray Charger Plate 14"
$52.12 The Jay Companies 1320382 Round Textured Ash Gray Charger Plate 14"
$89.96 The Jay Companies 1320390 Round Embossed Silver Charger Plate 14"
$89.96 The Jay Companies 1320398 Brown Beaded Rim Charger Plate 14"
$97.20 The Jay Companies 1320424 Round Embossed Silver Charger Plate 14"
$89.96 The Jay Companies 1320428 Round Embossed Copper Charger Plate 14"
$97.20 The Jay Companies 1320429 Round Embossed Brown Charger Plate 14"
$74.26 The Jay Companies 1421919BK-F Red Round Charger Plate 13"
With an antique and regal look, the Jay Companies 1320397 Brown Embossed Charger Plate 14" is suitable for more sophisticated dining establishments. 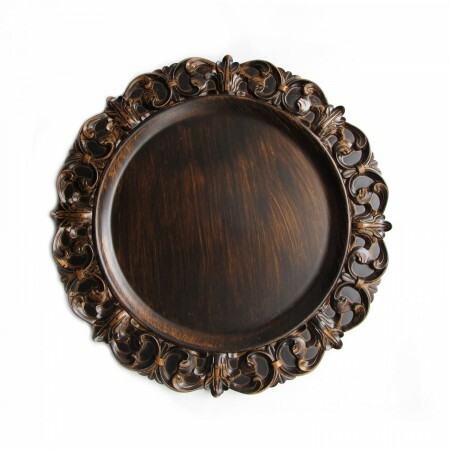 Featuring an embossed brown color with ornate edging, it has a decorative flair that will dress up your table and overall restaurant decor. Thanks to its durable polypropylene construction, and ample 14" diameter, this round service plate can hold all of your china dinnerware, from a soup bowl to a dinner plate. Turn ordinary meal service into fine elegance with this commercial quality charger.